The good news? 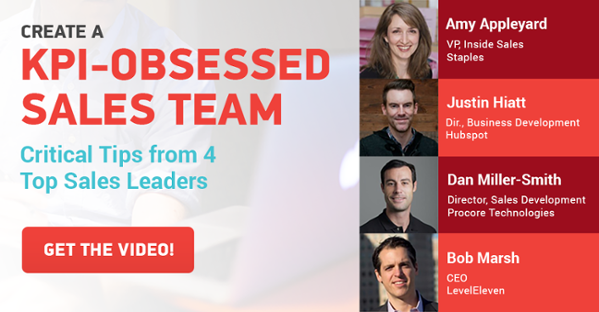 By now, some serious success stories exist to learn from – like HubSpot‘s. The software company launched as a grad school project in 2006 and only took a few years to hit the $100 million revenue mark. Today, 15,000+ customers use its inbound marketing and sales platforms, spanning 90+ countries. And when it comes to driving with metrics, Hubspot’s the poster child. Justin Hiatt, HubSpot’s Director of Global Business Development, is part of this success story. Today he helps to refine the organization’s metrics-driven framework, specifically for its 70 Business Development Representatives. 1. Remember: KPI data is only as good as its integrity. “It really starts with clean data,” Justin said on setting a strong KPI strategy. He learned this when his reps logged demos in different ways, making it nearly impossible to report on the activity. A new one-click button for logging demos offered a simple solution, increasing reporting abilities and the reps’ willingness to record the activity. 2. Work backwards to set KPIs. 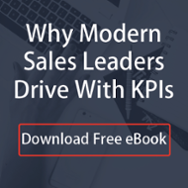 When breaking your sales process into KPIs, start with your main goal and move backwards to identify the activities that lead to it, or the leading indicators. “…working backwards from the end goal, like revenue, through the front end of the sales process will actually help the salesperson understand the necessary activity required to achieve their goal,” Justin said. 3. Set actionable KPIs at an achievable level. “I can tell you from experience…setting the bar too high is extremely discouraging to people,” Justin shared. “Creating a sales culture where your reps feel they can crush their number is really pivotal to the success of your overall team and organization.” He added that the right hires should want to overachieve anyway, especially if you set up your culture to encourage it. 4. Only measure KPIs that drive results. Adjusting: Drive what matters today. By tightening focus on their KPIs framework, Justin’s team continues to see ROI. They recently increased overall sales activity by 26 percent and saw improvements in their number of sales meetings completed, Net Promoter Score, employee retention rate and revenue quota attainment, thanks to a sound metrics strategy. So there you have it: Nine lessons on metrics-driven sales coaching, courtesy of one company that has it down. To learn more, check out the full webinar recording. Hubspot's seen crazy growth, part of which comes from success with metrics-driven sales coaching. Here's what you can learn from them.